Bluegrass Pundit: Who is up for six California's? [...] Draper, who has shelled out $4.9 million on his oft-mocked and maligned campaign, announced he’ll submit petition signatures for the measure Tuesday and hold a news conference in Sacramento. 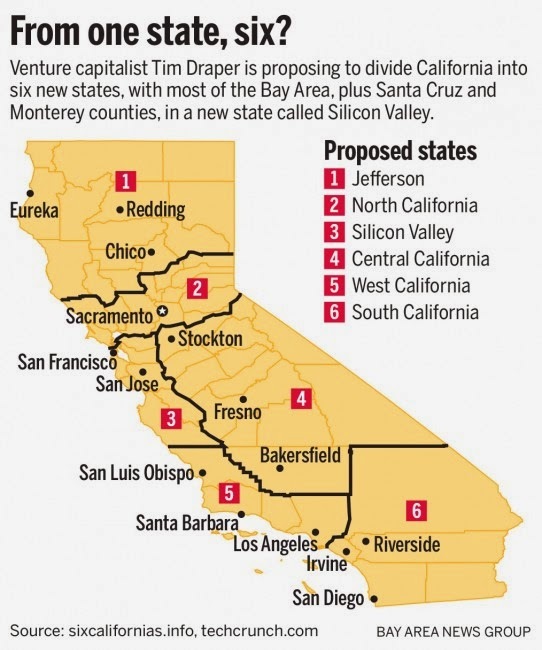 The measure would split California into six states, each with its own government; much of the Bay Area, plus Santa Cruz and Monterey counties, would become the state of Silicon Valley. California’s northernmost parts would become Jefferson, as some counties up there have wanted for years; some North Bay counties would become part of North California; Stockton, Fresno and Bakersfield would be among Central California’s largest cities; Los Angeles, Ventura and Santa Barbara would wind up in West California; and San Diego would anchor South California.